Specialty outdoor retailer REI Co-op is coming to downtown Columbia, bringing with it 45 new jobs. COLUMBIA, S.C. — Specialty outdoor retailer REI Co-op is coming to downtown Columbia, bringing with it 45 new new jobs. The retailer says it will build a 20,000 sq. ft. store in the BullStreet District in downtown Columbia. REI Columbia will be the second South Carolina location for the national retailer, with plans to open in Spring 2020. “REI is a brand that we’re sort of seeking out. 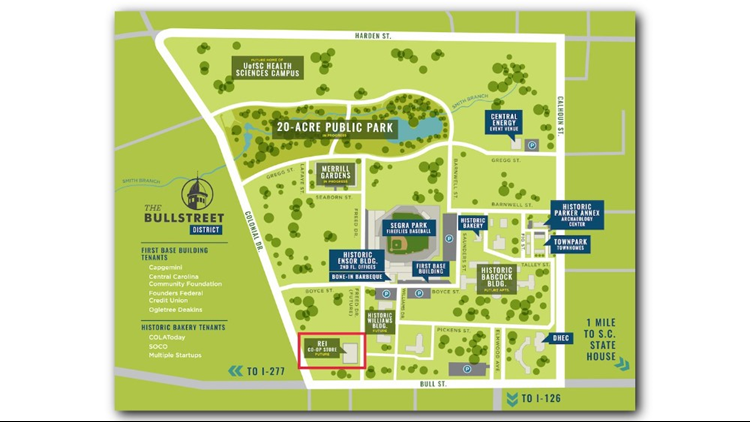 Their vision meshes so perfectly with what BullStreet is all about and what we’re trying to do," comments project manager Chandler Cox, "With an urban mixed-use environment they care so much about the environment and green projects so it really is sort of the perfect harmony of the two." Recognized as one of Fortune magazine’s “100 Best Companies to Work For” list for 22 consecutive years. REI says it expects to hire nearly 45 employees at the new store in Columbia. The more than 80-year-old Seattle-based company will offer quality outdoor gear and workshops that connect people to a life outdoors. While anyone may shop at REI, members pay $20 for a lifetime membership and share in the company’s profits through an annual dividend. There are more than 122,000 lifetime REI members in South Carolina. The co-op annually gives back nearly 70 percent of its profits to the outdoor community. As REI gets closer to opening in Columbia, the co-op plans to invest further in the local outdoor community in the Midlands and surrounding regions. “REI is on the cutting edge of lifestyle retailing that promotes the love of the outdoors, which our region embraces," says Robert Hughes, president of Hughes Development Corporation and master developer of the BullStreet District. The store will be located near the northwest corner of the district, at the intersection of Bull Street and Freed Street, one block from Colonial Drive. During the construction of REI’s store, Freed Street will be reconfigured to better connect Bull Street to the entry plaza of Segra Park, according to officials. The store will be designed by Wakefield Beasley Architects in Atlanta and built by McCrory Construction of Columbia.